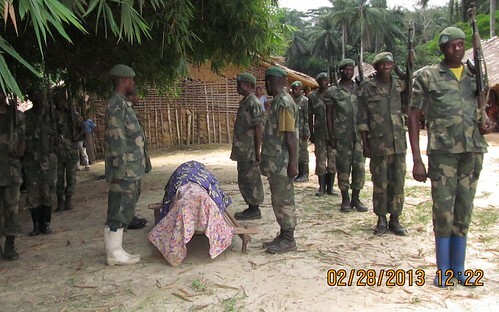 A military brigade encamped in the tiny village of Obenge buries one of its own. 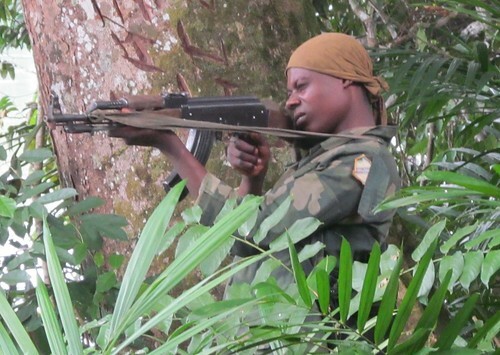 The outback of DR Congo is infiltrated with fortune seekers, outlaws, rebels and criminals. These are not all equally dangerous, but the “lawless” can quickly become “criminal”. 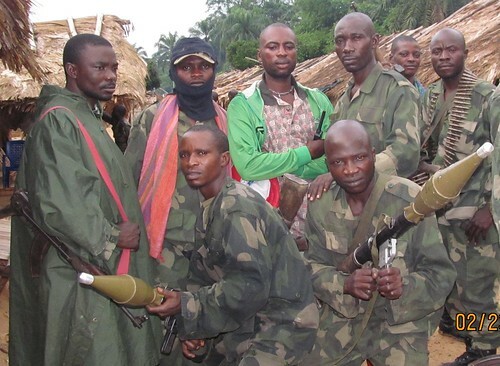 The tiny isolated village of Obenge was taken hostage. The process of its liberation revealed what the village had become — now it is nearly a ghost town. Obenge – a one track village – was host to a military band whose drums resounded from one end to the other and on out into the forest. 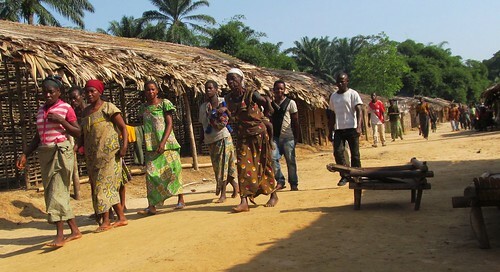 Obenge, on the bank of the Lomami, is the only village in the future Lomami National Park; as such the plan is to eventually help it re-locate. We, the TL2 project, have a base camp just upstream from Obenge. Chief Marie with the wise men of her court. Then Colonel Thoms’s renegade band expanded, new outlaws had come to the wilderness: John, “Fifty cents” and others. Much of the village of Obenge seemed more or less to fall under Thoms’s control. He preached anti-park, pro-bushmeat, pro-ivory. During a quieter time the TL2 team carries out a census of Obenge. Dino in red shirt. Obenge is remote and small. Our census of May 2012 gave us a total of 154 adults and 105 children. The largest nearby town, Opala, has no telephone connection, neither fixed nor cellular. The Lomami River is the road between the two. By its many bends the distance between Opala and Obenge is 245 river km. The only alternative is on foot; there is not even a bicycle track. 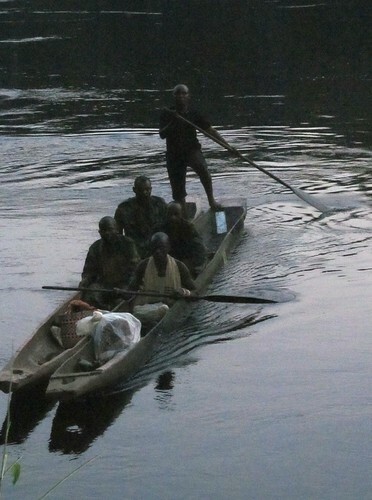 A paddled pirogue, even with several strong men pulling in unison, and even without much weight, takes a good six days against a strong current. Our TL2 project has the only outboard motor south of Opala. Map showing the future Park (green) and important villages, camps, and towns. 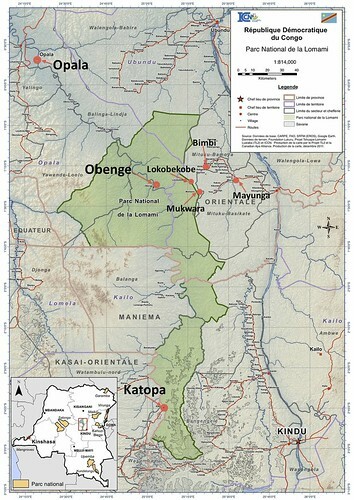 So, why is there a village like Obenge, with no school and no health-care? Is it because of a strong connection to the land; the traditional hand of the ancestor? Dino, who carried out the last census of Obenge reported that 39 households were local in the sense that parents of either husband or wife had lived in Obenge; another 17 had a house and gardens. The rest of the village consisted of traveling salesmen or other itinerants. They came to trade for bushmeat, often with products exorbitantly over-valued that put local people in debt, debts that could only be paid through bushmeat. 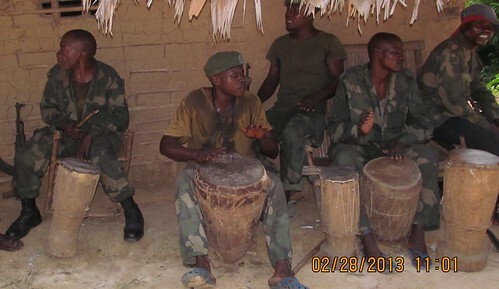 Many of the repeat bushmeat buyers, along with a certain group of intoxicated youth, joined Col Thoms’s band. In Februrary, when a military brigade came to the opposite bank of the Lomami, Col Thoms took Bravo Bofende, TL2 camp leader, hostage. Col Thoms threatened to kill him for having brought the military. In the chaos of a rainy night, with Col Thoms shooting in the air, Bravo escaped and helped a few military to cross the river into Obenge. The military entered an empty Obenge. But the truth is that we did not call the military and we are not even certain why they came. One rumor is that they were looking for the rebel military deserter Tshibangu. John suggests that Col Thoms might have sealed his own fate by shooting blindly at the military across the river. His frantic violence might have convinced them he had aligned with Tshibangu; perhaps he had, perhaps that is where the new members of his band came from? The brigade commanders got support (via Thuraya) from General Kifwa in Kisangani to stay and help clean out the poachers and bandits. Faced with superior arms, and despite the magic that supposedly protected him, Col Thoms fled with his unscrupulous band. The whole village fled, terrified by the military…200 of them. A first job of our TL2 leader, Bravo, who stayed on was to bring the villagers back to their homes. A second job was to be sure that the military had TL2 guides in their search for Col Thoms. Bofenda and the military with their superior weaponry, mainly not very useful for forest guerilla warfare. 18 February: At 14hr I hear men across the river. It is the 10th military brigade and they are calling for dugouts in order to cross. Col Thoms refuses. 18h45- Col Thoms has sent the acting village chief to take me hostage. 19h15 – Col Thoms interrogates me, says I called the military and threatens to execute me. 20h – in complete darkness he begins to shoot in the air and towards the military. This gives us the chance to flee. Me, Janvier, Vavisi, Florent et Chindani (loyal youth from Obenge) run in the rain. 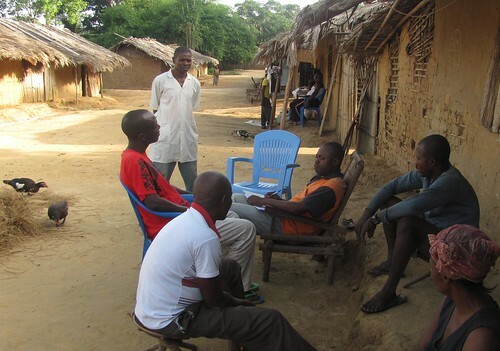 We cross in the dugout of Kapere (stalwart supporter from Obenge). Col Thoms, when he realizes what happened follows in the early morning to reclaim the dugout. We sleep under the trees. 19 February: We find the military and two tiny fishing dugouts. One by one a few military cross the next night. These pirogues are more than twice the size of the little fishermen’s push-abouts that the military used to cross the Lomami under cover of darkness February 19th-20th. 20 February: from 6h until almost 9h fewer than a dozen military – but with one machine gun – exchange fire with Col Thoms and his band. When I cross back at noon the village is empty. The Obenge population, all that had not fled with Thoms, slowly came out of hiding. They were called to an outreach meeting with the military. 21 February: Military follow numerous paths in search of the scattered bandits and the frightened villagers. 25 February: First four prisoners are taken. 26 February : Two more prisoners taken. 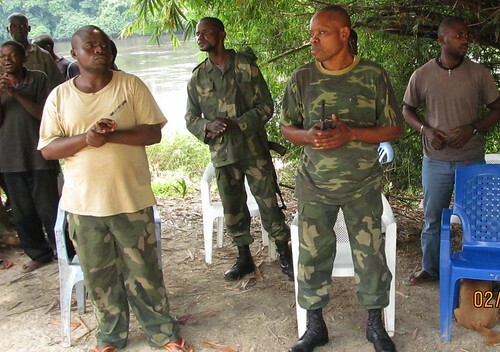 Major Moise, a bushmeat buyer and Thoms collaborator, is arrested. 11 April: Col Thoms still on the loose. He and a gang of a dozen or so erect a barrier in the forest at Mukwara and Lokobekobe (see map above), keeping people from bringing supplies from Bimbi to Obenge. 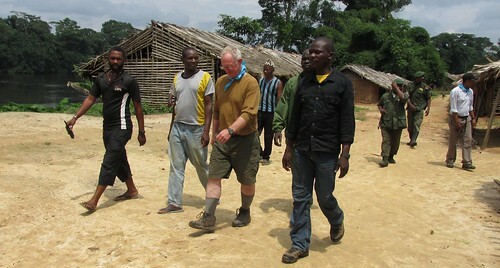 In early May, John came down the river to Obenge from our southern camp on the Lomami, Katopa. He found some military still camped out at Obenge, others had taken off in various directions searching for the outlaws. This is now the fourth month. At least 6 poachers or their associates have been arrested; others have been held, interrogated and released. Four brigands, including Poacher John, have been killed in skirmishes with the military. Back in the park, TL2 field teams are already out in bivouac camps. They report that the forest on the lower Tutu Basin has not been so calm in years. I just received a report that there is abundant sign of elephant on our study area. 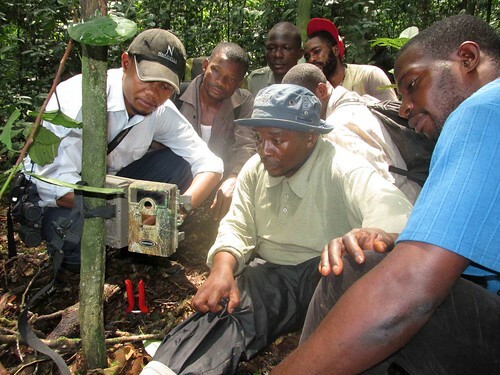 Maurice, TL2 team leader, is leading a training for camera trap use in early May at Losekola, our study area near Obenge. At the end of April, I came to Obenge with three of our senior staff from Katopa. We traveled two days down the Lomami to meet a second project pirogue and outboard led by Robert Abani with supplies coming up from Opala. This was the first outside visit to our Obenge camp since January. During my trip down the Lomami we checked out Col. Thoms’s rear guard camp three hours upstream from Obenge. Abandoned, the handful of small shelters had collapsed and grown over with vines and weeds. John in Obenge late April and early May 2013. Bravo Bofenda in black on the far left. There were fewer than 50 residents (men, women and children) remaining in Obenge at the time of my visit, all long-time members of the community who have homes and gardens. These few residents were outnumbered by the company of soldiers who had set up their posts in the gardens around the town and had made their headquarters in the abandoned home of one of Obenge’s poachers. The town’s commercial bushmeat buyers and their non-resident hunters were long gone. Bravo Bofenda, TL2 site leader, who witnessed the military operation from the beginning, told me he was shocked by how much bushmeat had been hidden in some of Obenge’s houses. When the soldiers arrived in the village their first action was to search every house. Hundreds of smoked antelope and monkey carcasses were recovered. This was quickly turned into rations for the soldiers as the commercial buyers retreated empty handed down river on every pirogue and raft available. “For a week it was paradise for those soldiers”, Bofenda told me. “But after that, there was nothing”. The two commanders of the Obenge brigade,Captain Simon on left, Captain Nzali on the right. Over evening glasses of Johnny Walker Black , a bottle I brought foreseeing the occasion, Captain Simon was non-committal about the specifics of his future operations. But he was clear that he and his soldiers would pursue the brigands to their hideouts across the Lomami in the scattering of Mituku hamlets east of the park. Within a week of my departure, Simon and the majority of his company, decamped to the east bank of the Lomami and moved from there against Thoms’s positions near Mukwara and Lokobekobe villages. There was at least one exchange of gun-fire last month between Thoms and the military during which four of the outlaws, including one of the most notorious elephant hunters, were killed. But Thoms and an unknown number of followers fled onward. 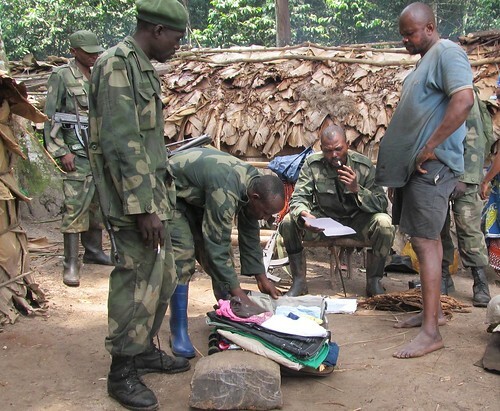 In a second firefight within the last few days, near the village of Mayunga closer to the Congo River and north of Lowa, at least two soldiers, a chef de groupement and a civilian woman were reported killed by Thoms’s band in a Thuraya communication between Bofenda and Captain Simon. The pursuit continues. The military company includes two TL2 guides, Washi and Vavisi. The pursuit is now far from the future Lomami National Park in a forested terrain of scattered small villages. For the last two years we have been working towards a resettlement plan for Obenge. The traditional authorities of the sector and territory are in agreement, but the details remain elusive. It is now urgent. Obenge has dwindled to almost nothing – a village site outside the park has been chosen: Litoko. If there is going to be any further congregation of bushmeat buyers – let it be there. Children are adored by all. 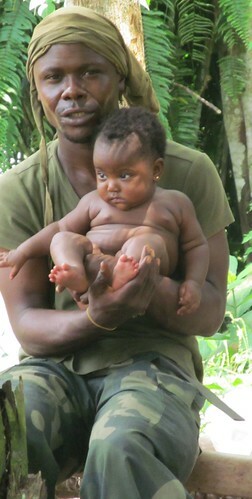 Soldier, LeBon, holds Kapere’s grandchild. All will be sad to see the last families go. 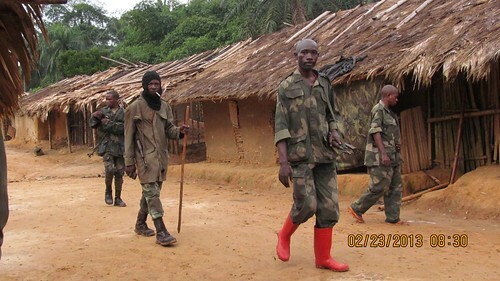 With the bushmeat buyers gone, with a good number of itinerant hunters joining Col Thoms and with the military encamped, Obenge’s ties to this bit of forest seem much weaker. 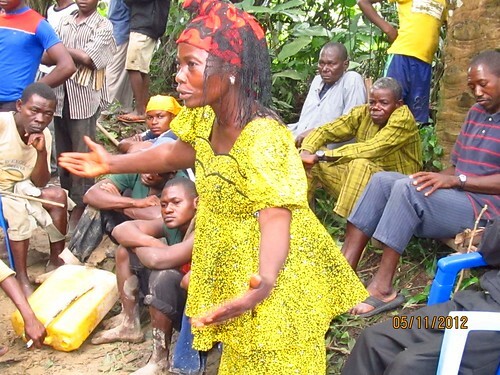 Obenge is resettling itself with little formal help. A soldier holds position during the arrest of several outlaws. This entry was written by Terese Hart, posted on 2013-06-11 at 8:19 pm, filed under Bushmeat, Elephant, Law and Order. Bookmark the permalink. Follow any comments here with the RSS feed for this post. Post a comment or leave a trackback: Trackback URL. A great story of a forest-defending hero, Bravo (Bebe) Bofenda … kidnapped by poachers and barely escaping with his life. We were lucky enough to work with Bravo at Bili, a few months before this story, where he showed similar fortitude standing up to corrupt, drunken, and heavily armed military. Unbelievable story, and such a relief to hear Obenge is emptying out. Thanks again for such careful reporting so we can follow along from afar. Best wishes to Bofenda and all TL2ers! We thank you again, and again for all your hard work and dedication! this couragness of bravo is amazing.